Alchemists need to learn the recipe, Transmute: Meat to Pet from BFA alchemy trainers, in order to create Quivering Sacs. When the opponent triggers the trap, they will take 394 Mechanical damage and be unable to attack for 1 round. After 3 rounds, the grenade detonates, dealing 591 Mechanical damage. This damage cannot be dodged, blocked, or avoided. Such a wasted breed for such a neat speed focused set. Oh well, at least it has aquatic damage and trap. I'm hoping it won't be completely overshadowed by wolvar. I think Blizzard must have been in a real hurry with the professions this expansion. 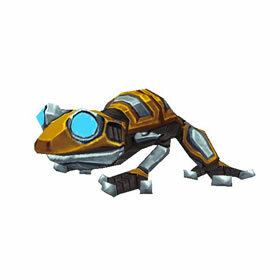 This cute lil' guy seems an obvious choice for an engineering pet. Instead alchemy is the sole source of craftable pets so far. Hey, look, a new player-created mechanical pet in BfA! Created by alchemy for ... reasons! Mechanical Toads can hop over seven million times before their gears begin to wear out.